There was an era when the Romans enjoyed throwing Christians to the lions. This first-century persecution was spectacular entertainment contrived to get believers to renounce their faith in Christ. 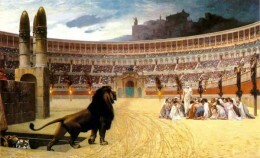 While thousands watched and cheered in the Coliseum, fifty or more Christians would be tossed in the pit with lions—the crowd would watch them scramble and wait to see who’d deny Christ before being eaten alive. That’s the context from which Peter writes—that’s the image he invokes. Satan is like those lions; our Enemy is not just interested in hindering the advancement of the kingdom of God, he wants to destroy people. When we come to Christ, we automatically enlist in an army. That certainty has been entirely lost in the twenty-first century, especially in the affluent North American church. The nitty-gritty reality is that when Christ is our hope of glory, we are in the thick of spiritual warfare—every believer is a soldier. We are at war and it is on the scale of trench warfare; we are required to stand strong. According to the Apostle Paul we are to remember from where our strength comes; God’s mighty power. We have absolute assurance in the perpetual power of God. Spiritual warfare is real—we battle against powers and principalities that we cannot even begin to comprehend. We are to stand strong; no surrender, no defeat, no giving any quarter. Being tenacious is to be one of our characteristics. We ought to take a lesson from the bulldog. A bulldog’s nose is slanted backwards so that it can continue to breathe while it holds on tight in the midst of a fight. What an image to grasp and apply: In the thick of a brawl with all its hurts, disappointments, or failures we are to hold onto the rock of our salvation. No matter what, we are to never let go. Life changes—everything could change in a moment’s notice. Our lives can be turned upside down in a heartbeat. The only way we can endure is to base our assurance on a source that is omnipotent and immutable, all-powerful and unchangeable. It always comes to that, so that’s really where we ought to begin. When rotten stuff happens, do we grumble and complain, do we whine that God doesn’t care about us? We surely do if the source of security and stability in our life is anything but God; if that is the case then we are strolling on unsteady ground. We must understand that we will fall if we don’t fight—we fight so that we can take our stand against the devil’s schemes. God’s Word tells us, compels us, admonishes us, and actually orders us to stand. We are to stand strong and fight because evil exists, and the Enemy is cunning and tricky. Good soldiers of Jesus Christ stand strong and fight. Here’s the thing: We are all supposed to be good soldiers. 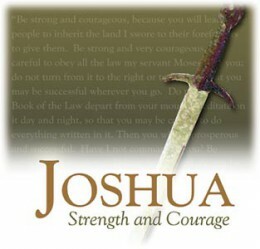 Take a new look at Joshua, an Old Testament iconic hero. For forty years he was in the midst of the Israelites wandering, wondering and waiting. When the legendary leader Moses died, Joshua was put in command. All the wandering, wondering, and waiting had prepared and refined the Israelites—they were finally ready to enter the Promised Land, to walk into the promises of God. There were, however, giants in the land; fierce and mighty people. There were armies, chariots, enemies, and fortified cities. The Israelites were extremely concerned. Perhaps even downright scared. As the one put in charge, Joshua must have had moments of sheer fear. He had seen how God had led and provided, but he’d also eye-witnessed the Israelites capacity for stiff-necked disobedience. The mantle of responsibility must have been heavy on his shoulders. The devil’s schemes—we need to remember exactly who the Enemy is and what tactics are forever employed. Our Enemy is the serpent of antiquity, always speaking with a forked tongue. Lying is his native language; when he speaks, he lies. He is a liar and the father of lies. Paul describes the battle as a struggle. The word he uses here actually refers to wrestling, but not the WWF or WWE style where the villain character bashes another performer’s head in with a chair. What is referred to by Paul is Greco-Roman wrestling, where two opponents are entwined with one another trying every move to pin each other to the mat. It’s extremely close quarters combat—it’s one on one. Some have mistaken this to mean that our struggle is with people, but that is flat-out wrong. Our struggle is not against flesh and blood. The spiritual warfare—the close quarters combat—we are continually engaged in is against those dark precincts under the dominion of Satan. 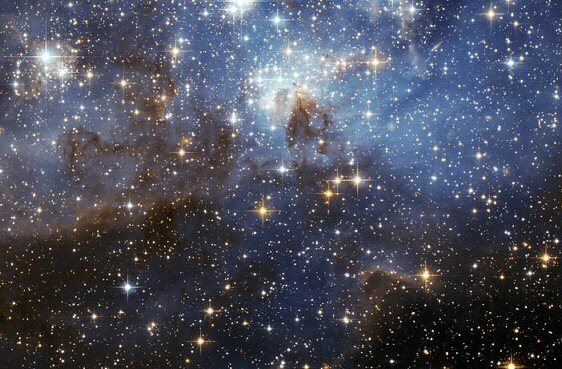 Our finite brains seldom if ever fully understand this fact, which is why we get entangled in dissension with others. The church is people living out their lives in community. The Enemy uses all means necessary to reap destruction on these relationships. In several New Testament passages directed specifically to believers in Jesus Christ, Paul wrote about husbands and wives, children and parents, employers and employees. He urged and encouraged tranquility in all our interactions—he did so because it’s ever so easy for us to be at odds with each other, which is detrimental in the extreme. Our struggle IS NOT with people. We may be mad or upset with one another, but that doesn’t mean we are enemies. Christians are brothers and sisters; we are family and we need each other. It is the fact that we need each other that God instructed us to never forsake the gathering of ourselves with one another. We are not alone—we face a common enemy. We need to recognize that we are brothers and sisters in the worldwide body of Christ on which Satan conspires to wreak havoc and destruction. The belt of truth to encircle and strengthen us—the breastplate of righteousness to protect our hearts—the gospel of peace, which keeps us in a state of readiness—the shield of faith to deflect and smother the fiery projectiles of the Enemy—the helmet of salvation to be proactive and secure the battleground of our mind—the sword of the Spirit to defend against and dismantle the timeless liar’s lies. We cannot pick and choose which pieces we’ll put on and which items we’ll not bother to use. 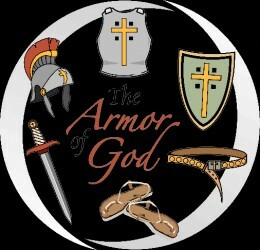 When we take off or refuse to apply one piece of armor, that area is exposed and vulnerable. Satan is no dummy—he doesn’t attack or weasel in where the armor is formidable, he searches for weak or vulnerable spots. We have to keep it on at all times. There is no interval we can let down our guard—there is no season when the Enemy stops the barrage. The moment we think we’re safe is the most dangerous instant of our lives. God is faithful—even when we are faithless, his love and faithfulness are unconditional. He lifts us when we fall—he always remains ready to nudge us onward and upward. We are at war. There are different issues or places where we each will draw the line, but do not be deceived; in our faith-life we all must make a stand. To recap: Our strength comes from God’s mighty power—we fight because we are soldiers and so that we can take our stand against the devil’s schemes—our Enemy is the despicable father of lies—we must take full advantage of the equipment provided and put on the full armor of God. Ultimately, after we have done everything, we must stand.